Everything we do at AltSchool—from the design of our schools, to our pedagogical practices, to the ways in which we develop our platform to support learning and teaching—is in service of students, with the goal of enabling every child to reach his or her potential. Our approach is deeply rooted in research, and I’d like to share a glimpse into three pilots that demonstrate how we are tying our beliefs about learning into practice in our lab schools, and developing technology to support student-driven learning. One key focus in learner-centric education is ensuring that learners build the agency to increasingly drive their learning pathways through the process of effective goal-setting. The essential question we set out to answer with these pilots: How might we leverage technology to support an effective goal-setting process between student and educator? Research has increasingly shown that beliefs about intelligence are important predictors of student behavior in school (1), and that setting goals increases student motivation (2). This has a couple of practical implications. First, educators can prompt students to feel more in control of their learning by encouraging them to set learning goals rather than performance goals (i.e., goals for competence or approval). Another implication is that students who are motivated by mastery goals are more likely to persevere in the face of challenges, and more likely to choose more difficult but rewarding ways to demonstrate learning. In addition, difficult tasks or setbacks don’t diminish their motivation or self-esteem (3). Intrinsic goal-setting is an important step in developing learner agency. The effects of goals on motivation and behavior, however, depend on their properties. For example, we’ve known for a long time that setting specific goals for students to achieve rather than simply telling them to “do their best” increases their motivation (4). From a practical standpoint, this simply means that adding structure to goal-setting increases effectiveness. Two examples of this are the SMART and WOOP frameworks. Learners who have access to goal-setting structures such as these build goals that are likely to have greater impact compared to those who don’t apply these structures. AltSchool uses both SMART and WOOP, informed by individual learners’ preferences and outcomes. Goal-setting that is SMART (specific, measurable, actionable, relevant, and trackable) matches key learning outcomes (5), whereas WOOP (wish, outcome, obstacle, plan), a model of mental contrasting, supports behavioral changes (6). Self-monitoring progress toward goals is another crucial component of developing learner agency, as it ensures that the goals are translated into action (7). The practical implication of this principle is that the more often a student monitors progress toward a goal, the greater the likelihood that he or she will succeed. Additionally, the frequency and integration of reflection toward goals leads to greater attainment. But what does it look like when these cognitive principles are put into action in a school environment across different age bands? Here’s a look at three pilots currently in flight in our lab schools. Learn how to drive student agency with goal-setting. Synopsis: Educators Sophia and David are co-designing reading goals with their students, who decide whether they would like to design a reading goal related to: stamina ( I will read for ___ minutes at a time with focus), frequency: (I will read ___ times a week at home), or growth (I will move one reading level in ___ weeks). In weekly 1:1 coaching conferences, David and Sophia help students divide their big goals into weekly micro-goals. Students use wall-mounted QR codes (associated with their reading goal) to document their progress on micro-goals each week. During the coaching conferences, students also reflect on their the progress of their micro-goals. As designers of their own goals, and with weekly conferencing that keeps them accountable and provides a view of progress, students are intrinsically motivated to become better readers. Students purposefully document evidence specifically geared toward their particular goal, such as a picture of reading log for stamina-related goals, or pictures of book covers and lists for level-related goals. Students are excited to report their progress in 1:1 reading conferences! Learn more techniques for student assessments from Colleen. Synopsis: In advisory with their educator, Jaqi, our middle school students are creating their own goals and then applying a clear and consistent process for tracking goal progress, using the WOOP framework. Starting with a wish, students envision the outcome, identify an obstacle, and make an action plan. 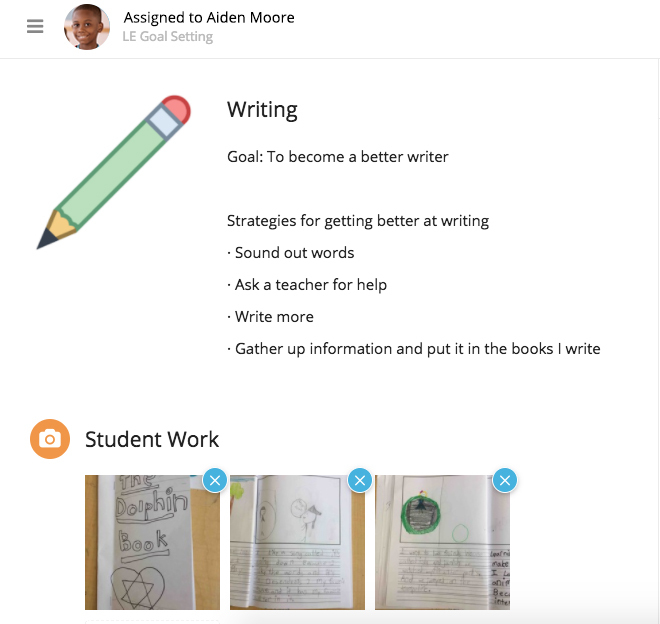 Using the Goals Tool in the AltSchool platform, Jaqi adds the students’ goals and creates a coordinating Card in the students’ Playlists to serve as a reminder of the goal as well as a place to document images and reflections. Students work with Jaqi to design methods for tracking their goals in the form of a graph or a chart. In the example below, you can see a student tracking his hours of sleep. In 1:1 coaching sessions with students, Jaqi works with students to analyze the data and reflect on progress together. Students have stayed committed to their goal tracking. Students demonstrate a growth mindset and sense of self-efficacy. Synopsis: Educators Jenny and Zhanna are asking their students to self-assess their work against a rubric and use that to guide themselves toward their goal of mastery. Students begin by analyzing their work and determining which level of the rubric they are currently at. Then students look at the next level of the rubric to set goals for improving their skills. This work is self-paced. So far, Jenny and Zhanna have used this process with a classwide journaling rubric. They plan to repeat the process with a Montessori card observation rubric. The educators have reported a reduction in students asking for help and/or procrastinating during work blocks. These three pilots are still in the early stages, but we’re excited by the promise they’ve shown and we will continue to share our learnings from initiatives that are underway in our lab schools. 1. Burnette, J. L., O’Boyle, E. H., VanEpps, E. M., Pollack, J. M., & Finkel, E. J. (2013). “Mind-sets matter: A meta-analytics review of implicit theories and self regulation.” Psychological Bulletin, 139(3), 655-701. 2. Elliott, E. S., & Dweck, C. S. (1988). Goals: An approach to motivation and achievement. Journal of Personality and Social Psychology, 54(1), 5-12. 3. Grant, H. & Dweck, C. (2003). "Clarifying achievement goals and their impact." Journal of Personality and Social Psychology, 85(3), 541-553. 4. 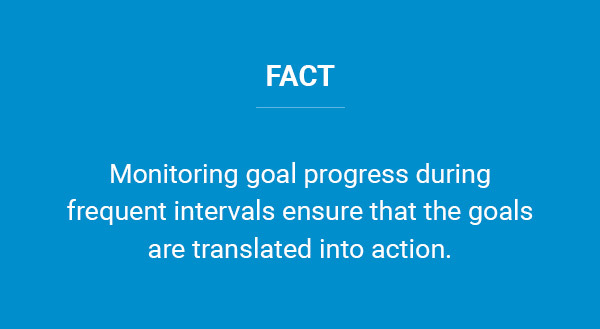 Harkin B, Webb T, Chang P, et al (2015) “Does Monitoring Goal Progress Promote Goal Attainment? A Meta-Analysis of the Experimental Evidence.” Psychological Bulletin American Psychological Association, 142(2), 198 –229. 5. Locke, E.A., & Latham, G.P. (2002). “Building a practically useful theory of goal setting and task motivation.” American Psychologist, 57, 705–717. 7. Pintrich, P. (2000). "Multiple goals, multiple pathways: The role of goal orientation in learning and achievement." Journal of Educational Psychology, 92(3), 544-555. 8. Smiley, P. A., & Dweck, C. S. (1994). Individual differences in achievement goals among young children. Child Development, 65(6), 1723-1743.